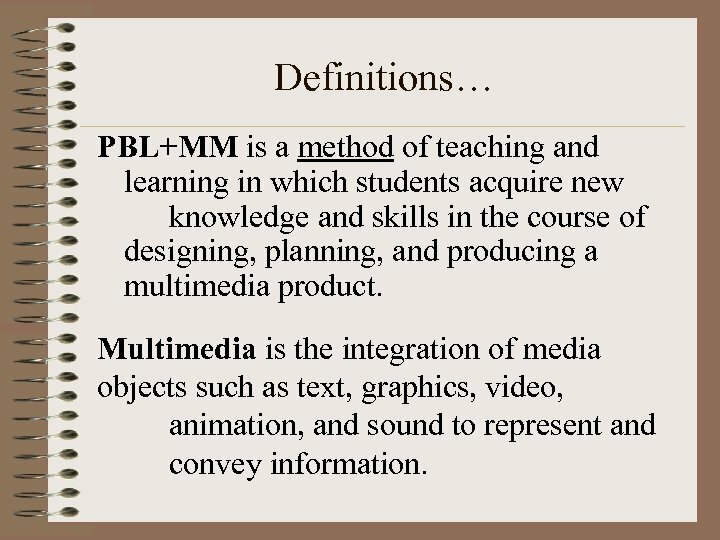 Definitions… PBL+MM is a method of teaching and learning in which students acquire new knowledge and skills in the course of designing, planning, and producing a multimedia product. Multimedia is the integration of media objects such as text, graphics, video, animation, and sound to represent and convey information. 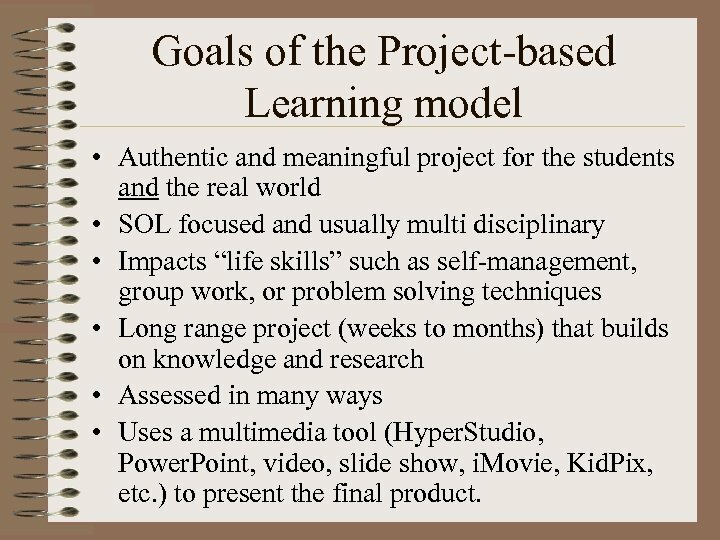 Goals of the Project-based Learning model • Authentic and meaningful project for the students and the real world • SOL focused and usually multi disciplinary • Impacts “life skills” such as self-management, group work, or problem solving techniques • Long range project (weeks to months) that builds on knowledge and research • Assessed in many ways • Uses a multimedia tool (Hyper. Studio, Power. Point, video, slide show, i. Movie, Kid. Pix, etc. ) to present the final product. 3. Schedule • Decide on date of final project. 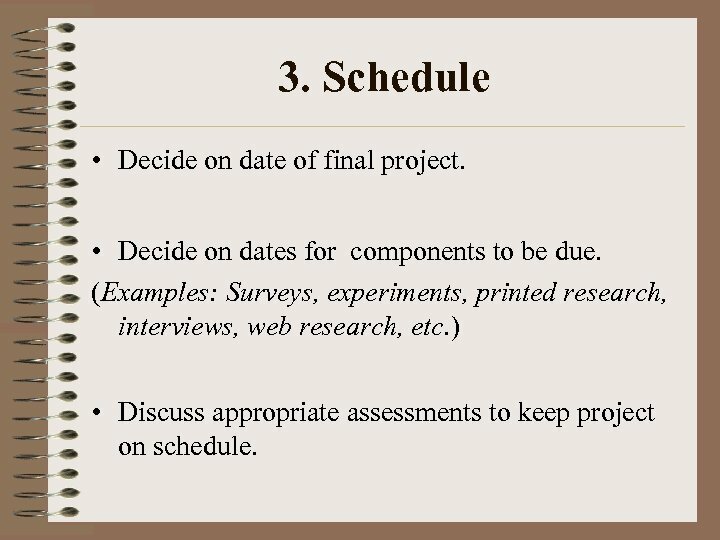 • Decide on dates for components to be due. (Examples: Surveys, experiments, printed research, interviews, web research, etc. ) • Discuss appropriate assessments to keep project on schedule. 4. Project • Students - working in groups - begin project. • Teacher monitors activities and encourages groups to plan, implement and evaluate activities. • Teacher makes suggestions as to pacing, direction and team member’s accountability. 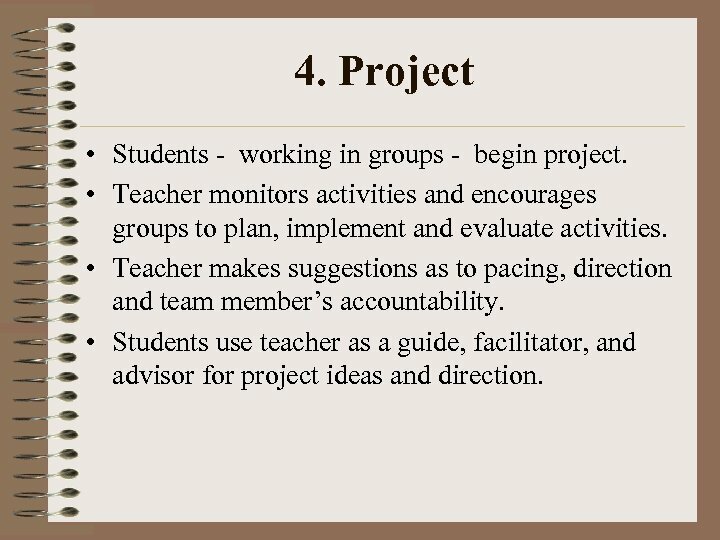 • Students use teacher as a guide, facilitator, and advisor for project ideas and direction. 5. Assessment • Discuss checkpoints and goals. 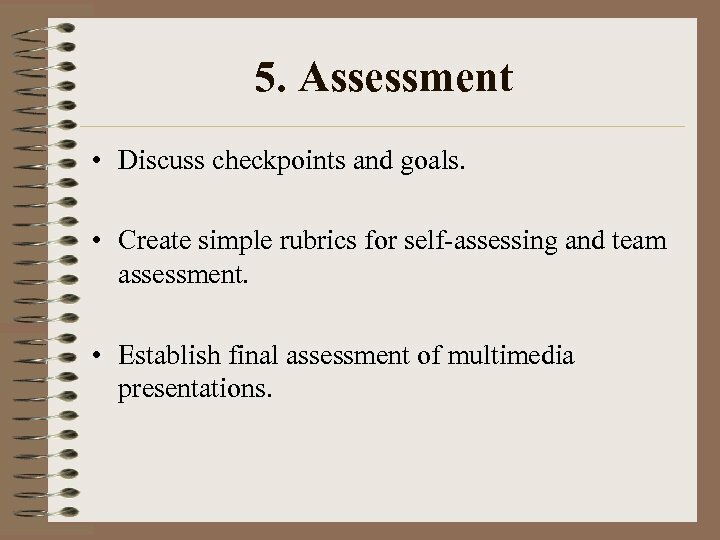 • Create simple rubrics for self-assessing and team assessment. 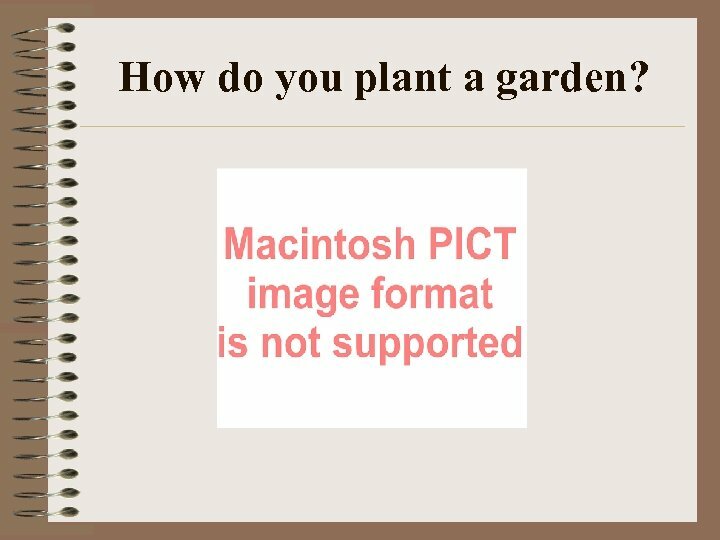 • Establish final assessment of multimedia presentations. 6. 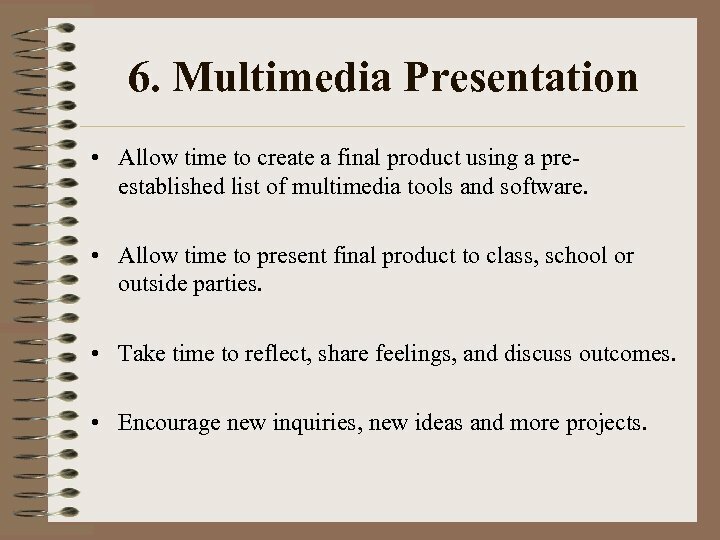 Multimedia Presentation • Allow time to create a final product using a preestablished list of multimedia tools and software. 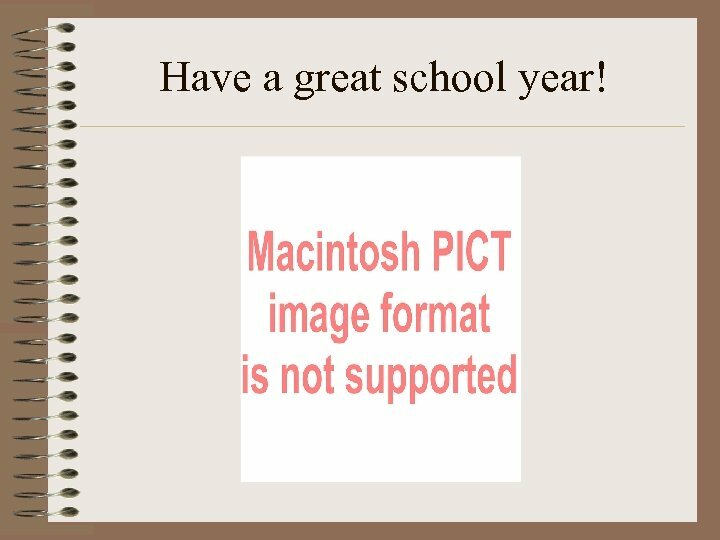 • Allow time to present final product to class, school or outside parties. • Take time to reflect, share feelings, and discuss outcomes. • Encourage new inquiries, new ideas and more projects. Where Do You Start? • Think of an exciting “real world” project that would support or validate your curriculum. 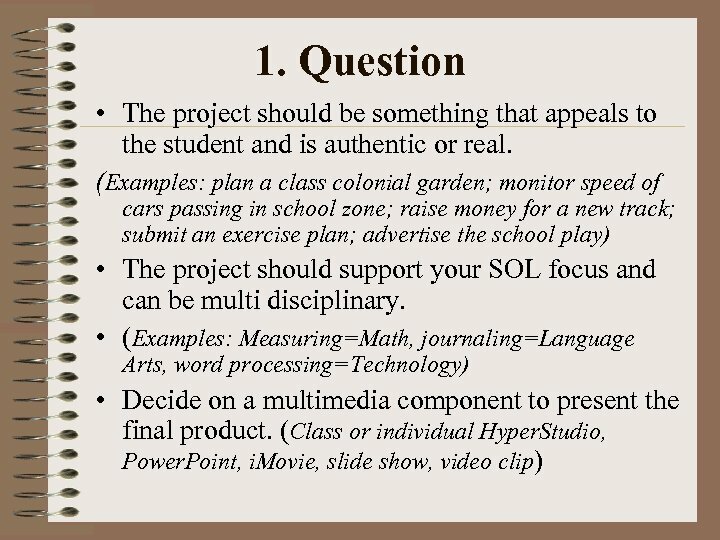 Projects must be authentic to motivate the students. Elementary: create a weather station or bird station; plan snacks for field day; collect items for a nursing home: send letters to a person in the service. Secondary: Use the question, “Why are we studying this? ” and suggest a real project to use those content skills. Examples: Design a kite (math and science); plan a trip to “X” (geography, math, economics); find an apartment (marketing, math, regional economics). Then what? 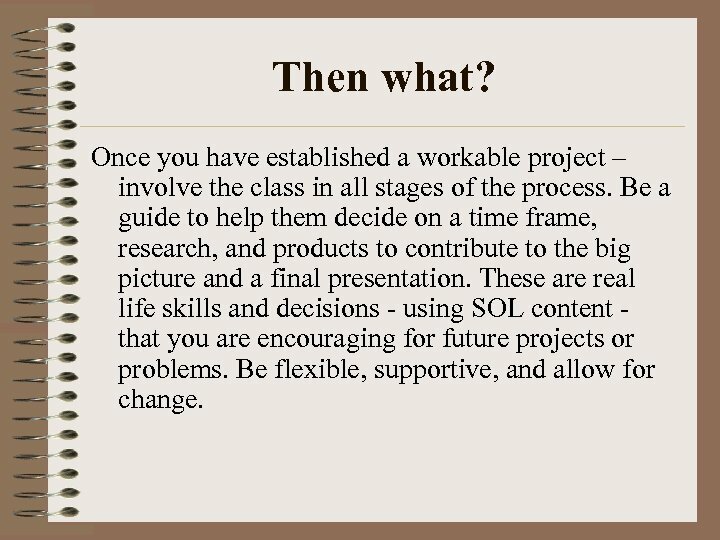 Once you have established a workable project – involve the class in all stages of the process. Be a guide to help them decide on a time frame, research, and products to contribute to the big picture and a final presentation. These are real life skills and decisions - using SOL content that you are encouraging for future projects or problems. Be flexible, supportive, and allow for change. What Resources Are Used? Unlike a Web. 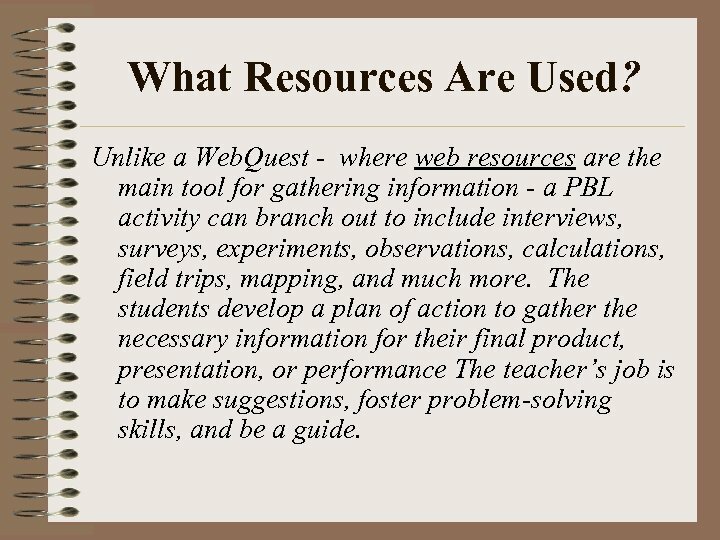 Quest - where web resources are the main tool for gathering information - a PBL activity can branch out to include interviews, surveys, experiments, observations, calculations, field trips, mapping, and much more. 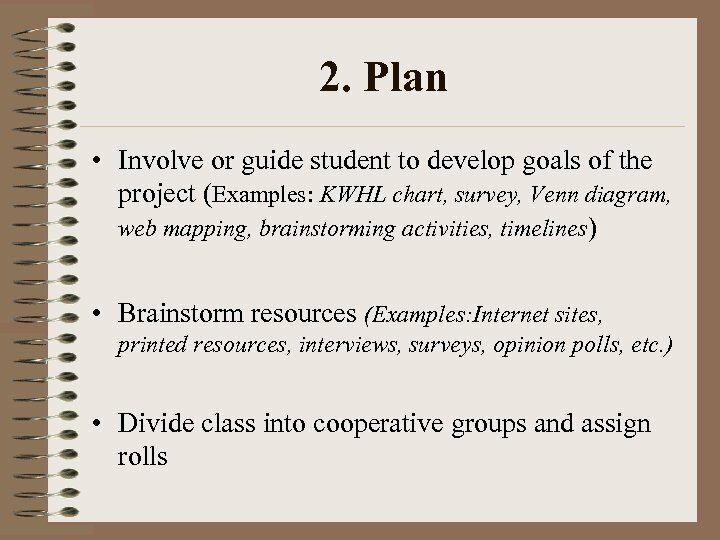 The students develop a plan of action to gather the necessary information for their final product, presentation, or performance The teacher’s job is to make suggestions, foster problem-solving skills, and be a guide. 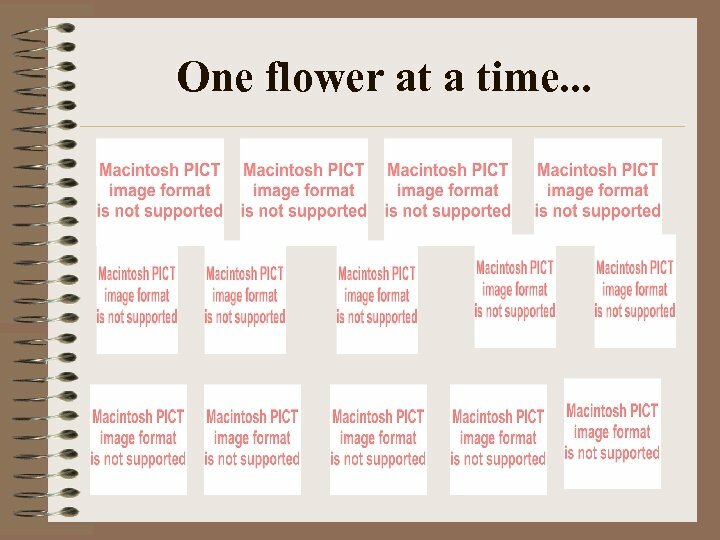 One flower at a time. 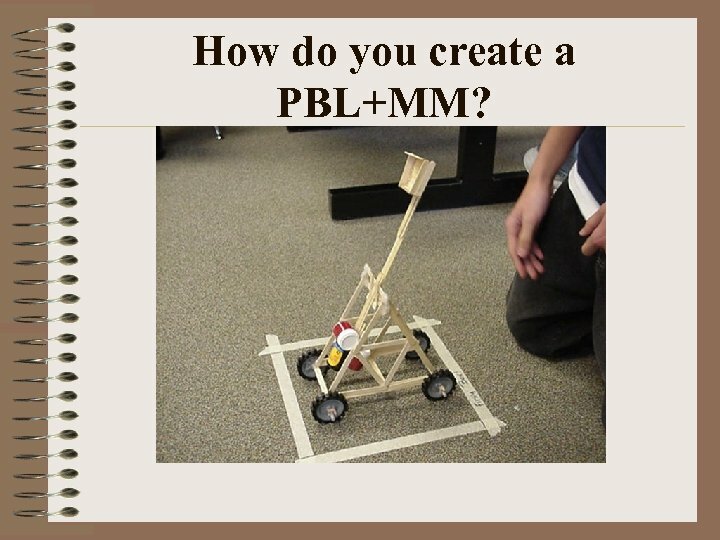 . .
How do you create a PBL+MM? One step at a time. . . 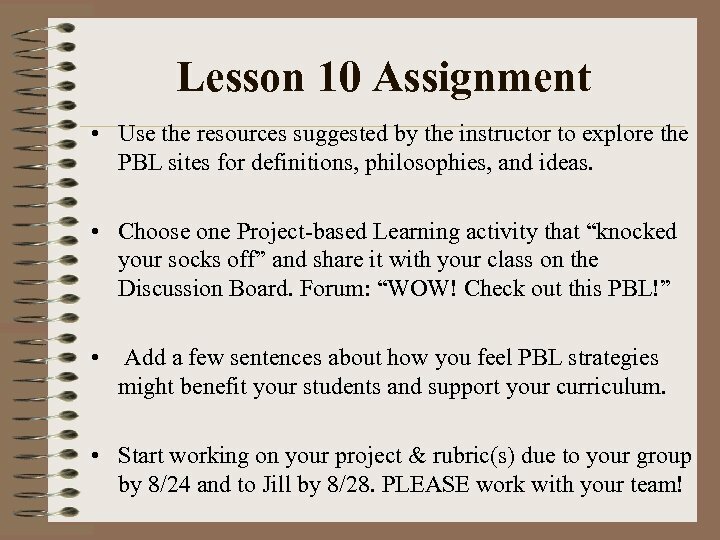 Lesson 10 Assignment • Use the resources suggested by the instructor to explore the PBL sites for definitions, philosophies, and ideas. • Choose one Project-based Learning activity that “knocked your socks off” and share it with your class on the Discussion Board. Forum: “WOW! 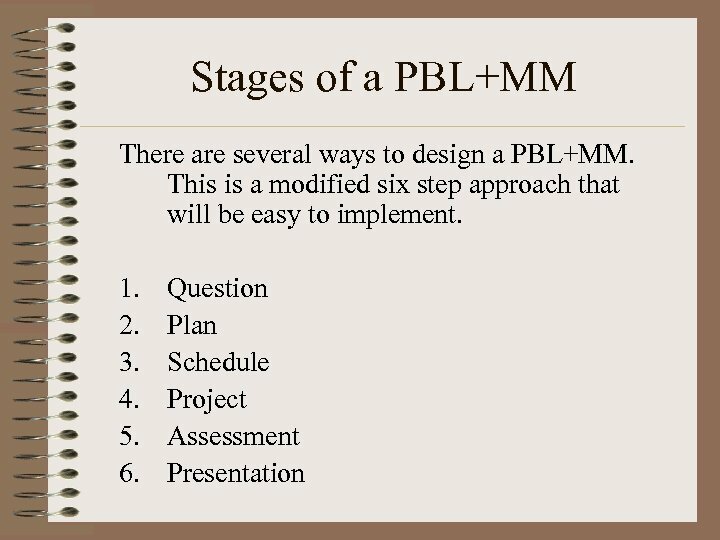 Check out this PBL!” • Add a few sentences about how you feel PBL strategies might benefit your students and support your curriculum. 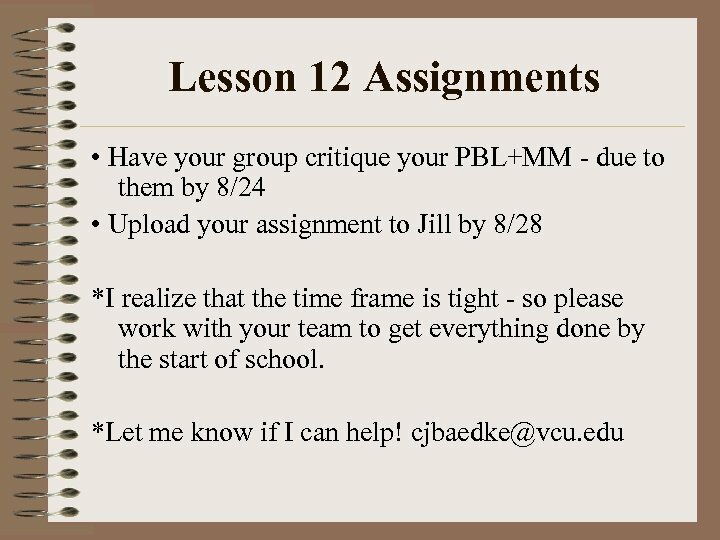 • Start working on your project & rubric(s) due to your group by 8/24 and to Jill by 8/28. PLEASE work with your team! 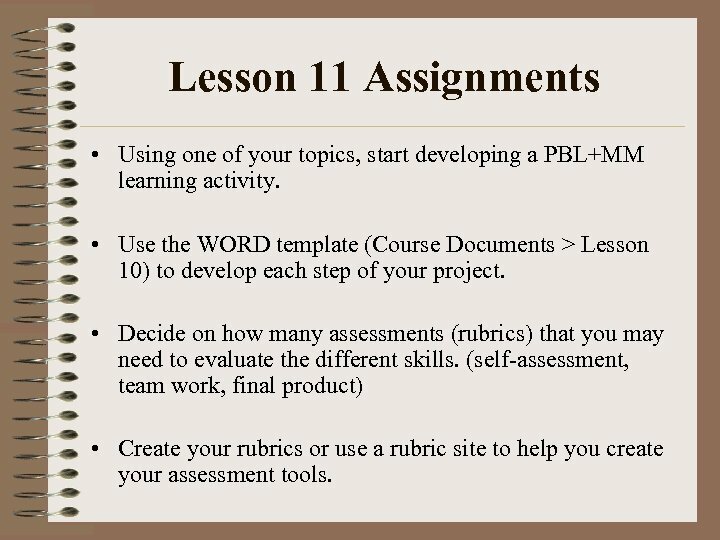 Lesson 11 Assignments • Using one of your topics, start developing a PBL+MM learning activity. 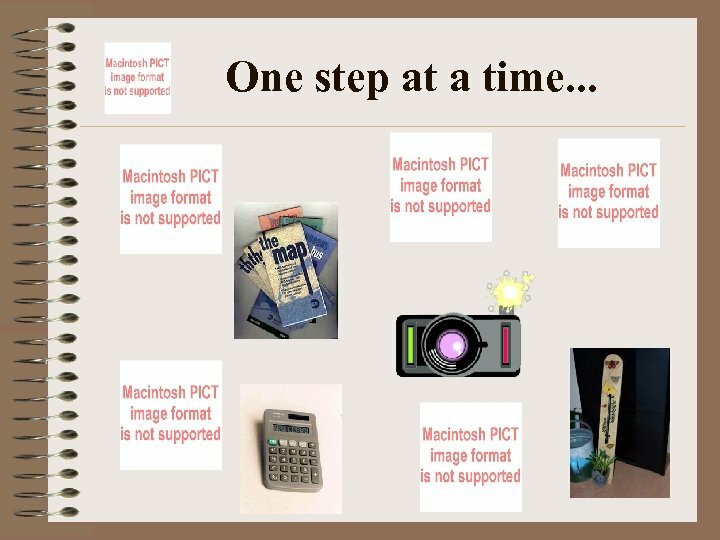 • Use the WORD template (Course Documents > Lesson 10) to develop each step of your project. • Decide on how many assessments (rubrics) that you may need to evaluate the different skills. (self-assessment, team work, final product) • Create your rubrics or use a rubric site to help you create your assessment tools. Notes: • Lessons 13 and 14 (9/18 & 9/25) will be considered independent study as you implement TWO of your projects - although this implementation can be started earlier in the month. 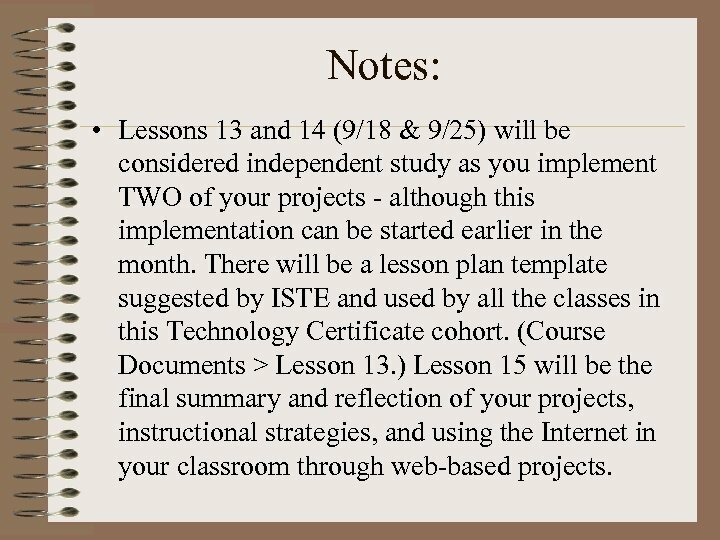 There will be a lesson plan template suggested by ISTE and used by all the classes in this Technology Certificate cohort. (Course Documents > Lesson 13. ) 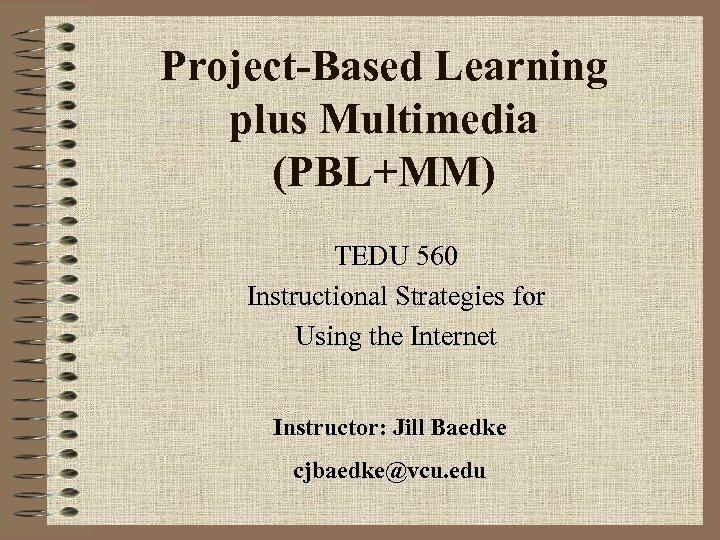 Lesson 15 will be the final summary and reflection of your projects, instructional strategies, and using the Internet in your classroom through web-based projects.